With only 60 to 70 frost free days a year, wildflowers take advantage of every summer moment. 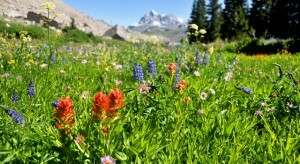 The lower elevations witnessed flora fauna blossom with vibrant color. As the weeks go by and the snow line continues to recede, vegetation will rise through the canyons and up mountain sides reaching all the way to the Teton crest.